As I dig through the old magazines, National Dragster’s and the like I keep running across ads that contain images of WG or of the Gapp & Roush vehicles. I thought I would break out a category on the site to spotlight them a bit. This one is interesting as it comes from the May 1977 issue of Cars Magazine. This is at the very tail-end of my Dad’s career and it has a vehicle that hadn’t been run under the G & R banner for about a year and half. ﻿MILAN DRAGWAY, Michigan – Sunday was the day the Pro Stockers invaded Milan Dragway and in spite of the cold weather, there was a large crowd of spectators on hand to witness the action. 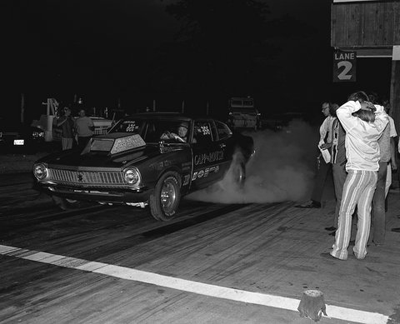 In the first round of action, Jim Wick in the “Matchmaker” Duster went up against Terry Hedrick in his “Super Shaker” Camaro. Wick passed through the top end lights first with a time of 9.73 at 142.64, while Hedrick was right on his bumper with a run of 9.90, 141.50. Unfortunately, Wick’s machine lost a master cylinder and ended up in the sand pit, ruining his chances to run the rest of the day. Next it was the “Shotgun Express” of Gapp and Roush against the Gremlin of Gilbert and Maskin. The Gapp and Roush entry was working perfectly as Wayne Gapp put down a time of 9.79, which was good for a win at 142.86 mph. Rich Maskin is still working “the bugs” out of his brand new Gremlin and was only able to run a 10.10, 134.32. Rich has been one of the most feared competitors in the Modified Eliminator category in Division 3 for several years and when the Gremlin starts to run, watch out! The final run of round one pitted Ernie McEwen in his Mustang against the Sutka Bros. McEwen on that race hands down with a time of 10.24 at 134.93. Because of Jim Wick’s mishap, Terry Hedrick took his place in the final round o action. His opponent was to be the “Shotgun Express” of Gapp and Roush. Both drivers staged very carefully and when the lights counted down Gapp and Roush left first and they held their lead to win the honors with a time of 9.69 at 144 mph. Not many folks get a win at NHRA’s U.S. Nationals. It is considered THE race of the year. This is from the July 25th 1975 Issue of National Dragster. See the original entry here. Of all the evening’s winners, few enjoyed the ceremonies more than Wayne Gapp, the man who has been a frontrunner all year, but seemingly had some trouble with coming through in the final rounds. After losing the Winternationals to Bob Glidden on a holeshot and then fouling to Glidden in the Gatornationals final, Gapp admittedly had been the subject of criticism within the ranks as for his driving expertise, but the skeptics were silenced at this race as he came through in flying colors via a solid trouncing of Bill “Grumpy” Jenkins (8.80 to an 8.93) to claim the win and stop Jenkins’ own personal three-event winning streak at Summernationals events. A major factor behind the Gapp & Roush win was their frantic engine change between the second and third rounds. After hitting an 8.96 in the first round, Gapp slowed to 9.03 in the second, and concluded that his engine had “gone south.” The subsequent engine change brought forth a resounding 8.84 in the semi’s, setting the stage for his 8.80 thrashing of “the Grump.” The 8.80 was, of course, Low E.T. of the Meet and also a new National Record. Jenkins did have the consolation of setting Top Speed with a clocking of 154.90 mph. This is a pic, provided to me by Tom Tate, of G & R’s first Pro Stock Maverick. Boss 429 Power. Lot’s of shaking out of the concept and the engine occurred on this vehicle. 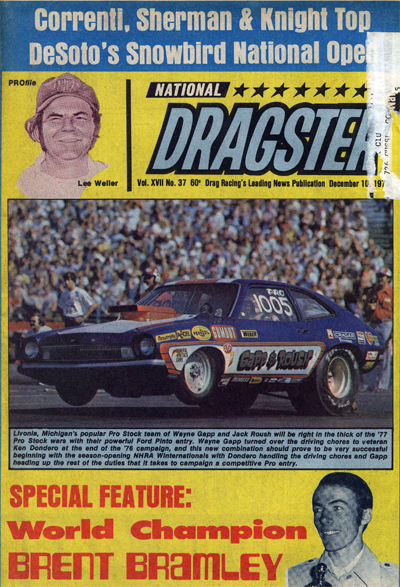 This might be the last time a G & R car was on the cover of National Dragster. 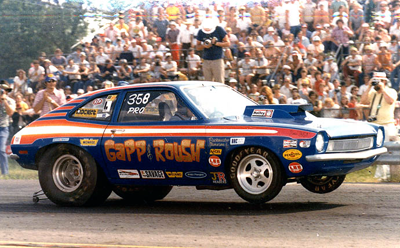 Livonia, Michigan’s popular Pro Stock team of Wayne Gapp and Jack Roush will be right in the thick of the ’77 Pro Stock wars with their powerful Ford Pinto entry. Wayne Gapp turned over driving chores to veteran Ken Dondero, at the end of the ’76 campaign, and this new combination should prove to very successful beginning with the season-opening NHRA Winternationals with Dondero handling the driving chores and Gapp heading up the rest of the duties that it takes to campaign a competitive Pro entry. CECIL COUNTY DRAGWAY, Bayview, Md – Wayne Gapp took the WAMS All American Pro Stock Championship and his second Pro Stock Victory at Cecil County Dragway this year and was one of only 2 pro cars in the 8’s all day. Herb McCandless maede the only other 8-second run during the event after lightning up the Dodge to make a time run. McCandless wheeled the ‘Brooklyn Heavy” machine to a unreal 8.77. Iaconio was Gapp’s first victim of the day as Gapp’s 9.25 just nipped Iaconio’s 9.29 in the traps with both cars clocking 146 mph. Larson then trailered Frank Russo’s entry with a slower 9.23 to Russo’s 9.19. Then Richie Zul defeated Herb McCandless, 9.03, 152 mph to 9.17, 150 mph, and Shafiroff wheeled by “Dyno Don” in the closest heat of the first round with a 9.06 at 150 mph to Nicholson’s 9.07 at 148 mph. Second round saw Gapp make Larson victim number 2 as he blasted out the first 8-second run. Gapp shut the clocks off with an 8.98 at 151 mph, while Larson hit a find 9.17 at 148 mph. Shafiroff then sent Richie Zul back tot he pits with 9.07 at 150 mph to Zul’s qicker, but losing 9.02 at 151 mph. Ford versus Chevy – the age old battle pulled to the line for the final. Gapp’s Mustang II had the edge because of his 8 second blast, but Shafiroff has been known to pull a few surprises himself. But Gapp got there first with his second 8-second run, going another 8.98 while Shafiroff ran an equally impressive 9.04 to take the number 2 spot. Frank Russo met the Top Speed of the Meet with his newly painted Dodge at 157.89 mph while making a time run. Looks like a shakedown run. Have a bunch of other pics from the same day. I’m digging the big ‘Performance Engineering’ sign on the back. This is how I picture my Dad. Makin’ sure that things are going just the way he wants. He’s the guy on the left. Great shot of the Maverick at the 32081 Schoolcraft shop. This is the list of the NHRA National events for 1975. In particular 1st and 2nd place in Pro Stock. This is the same list of results from NHRA.com except that the this list is in order from top to bottom (i.e. 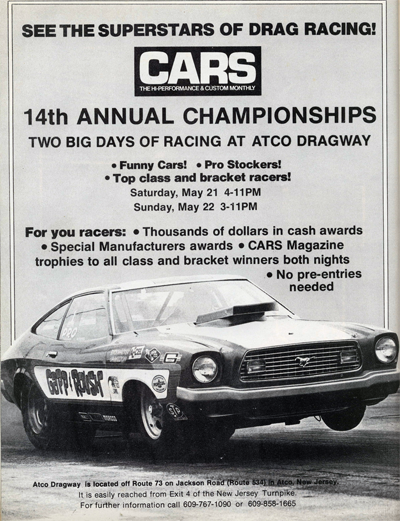 the first event of the year is first rather than NHRA’s listing which is last event first). The source for this list is here.